Just the name should give you an idea that we’re not talking about a massive AAA title here. Take all of the adjectives for a game that is intentionally outside the norm, and they all apply to this DSiWare/eShop game. It is a return to the story-less, core concept, score focussed games of old, and it does it very well. The plot is completely irrelevant, and it’s all laid out in an opening ‘cutscene’, if you can call it that. Kokopolo is relaxing in a hammock, as his ant buddy Tetsumo sits on the grass nearby. Then Jinbe the ‘peaceful sky guardian’ floats by playing his bongo drums, one falls for no reason (yet when it cuts back up to Jinbe he hasn’t actually lost one) and hits Kokopolo, and then the feces hits the oscillating fluid movement device. And yes, I did have to look at the official website to figure out the name of the cloud guy. I’m not embarrassed to admit it, because quite frankly it doesn’t matter. Now, the core game is a fairly basic concept, you are put into maze-like levels that have ‘enemies’ walking or prancing around. Your job is to get them eaten by a plant, which you do by slashing them with your claws and leading them to it. To get an idea of what I’m talking about, watch this. So you can see the ‘enemies’ that you’re fighting are happy little woodland creatures minding their own business until you come along all slash-happy. 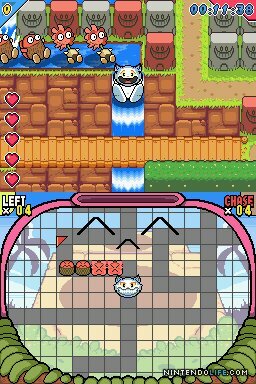 You are a cat filled with years of rage, which you satisfy by luring lines of enemies to be eaten by the snap-snap plant. You can play it safe by only luring one or two enemies at a time, or use the peaceful time before you slash anyone to wander about the level and plan your route through all of the spike pits, revolving doors, cannons, water falls and many other obstacles. difficult, much faster. 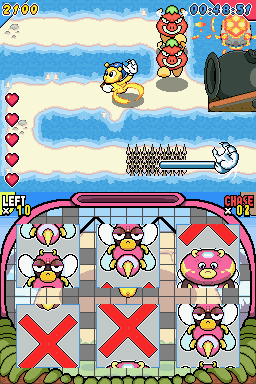 Now, this is clearly a game built to be intentionally difficult, like arcade games of old. Personally I have no problem with that, I very much enjoy conquering brutally difficult titles like the original MegaMan series. However, there are many people that will give up on a title and go play something else after a dozen deaths, and those people will quite simply not be able to see the entirety of the title. My other complaint would have to be the sameness of it, as you are playing a single concept and just having very minor variations of it. Because of that I would get bored with an extended playing session, but I found for periods of half an hour or so that let me beat (or attempt) a few levels, it was great. That’s really where arcade games work well, and I think were a DSi or eShop game should really focus. It’s quirky and weird, but darn if it isn’t a whole lot of fun.